Born in the 80`s in a family of five I always saw life to be so easy, fun and simple. The only life I knew was school, church and home. Being a playful, joyful child I could not complain, safety was highly felt in all my childhood years and to me the cases of today that affect the girl child weren’t there at that time since playing with boys was okay and because discipline was enhanced through schools, homes, churches or mosques and life was peaceful and sweet. In 2009 after gaining much knowledge about the YWCA and having read the story of Tamara in the Bible, changed my life so much, reading about something that the girl child is still experiencing up to date. Living at the coastal part of Kenya, the girls are married off early whether educated or not. This factor has affected me dearly since the girls take responsibilities too early under the circumstances of poverty making the chain even longer each day. They also go through the torment of torture either physically or emotionally. Parents and guardians marry off their girls due to the poverty crisis that they go through, it may be a short term relaxation without hunger or debts, but the family will still inherit the poverty disease. The traditions and customs of the coastal people view the girl child’s place to be in the kitchen, bear many children and should always emulate from the great grandparents who saw it fit for the woman to be in that position. The young women and girls in these communities have no role models in their families and communities forcing them to unwillingly commit to marriage and child bearing. Poverty has therefore been a chain of inheritance in many families and marrying off girls seems to be relieving them of that burden. The girls get thrown into the outside world without proper education, proper guidance from their parents or guardians. Instead they become at higher risk of contracting HIV or having unwanted pregnancies or suffering forms of violence at the hands of their so called husbands. In Kenya, 13,000 girls leave school yearly and live miserable lives. In school teachers who are supposed to be our second guardians cannot always be trusted. Statistics state that between the years 2003-2007, 12,660 girls got abused by teachers just because they could not pay for their fees or get materials for their learning. All these happenings made me advocate more for girls and young women after I read the story of the girls in Kilifi county where in a week girls sneak out for five times to look for fees through prostitution. One of the girls often acts as the broker (a 17 year old) who links them with men, advises them to abort when they accidentally get pregnant and the sad thing is that the teachers are also the culprits/clients of the students. The importance of girls being protected through education and gaining of knowledge. 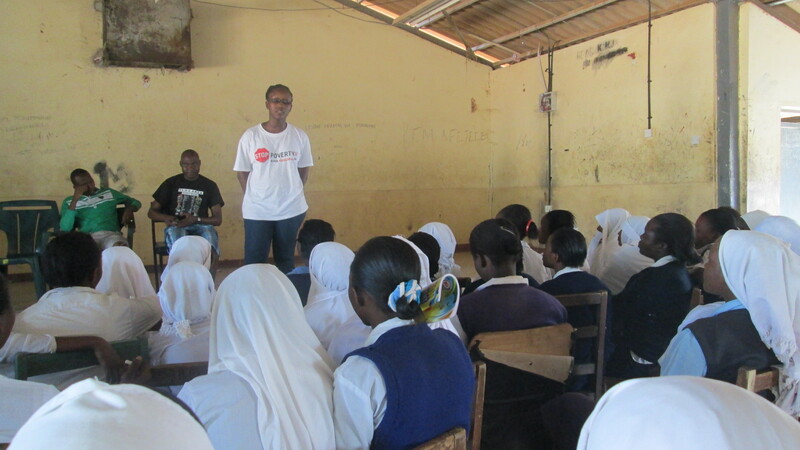 The importance of girls being protected through reproductive health talks. The importance of the community in realizing that early marriage is not a solution to poverty. That the traditions are important in embracing our culture but some are harmful to our girls and young women. It is my passion and dream to always mentor many girls and young women but my only hindrance is the availability of funds to move to the most interior and rural areas at the coast. I feel that there is a lot of work to do in curbing this menace, a lot of girls and young women are suffering due to lack of fees to continue with education even though it may be free in primary level but it’s not enough, lack of sanitary towels, pens or books. All these factors coerce these girls and young women to go against their principles. More and more programmes are to be enhanced to ensure sustainability and continuous nurturing and development of girls and young women. What they only need is mentorship and role models in their lives to enable them make their own sound decisions concerning their careers, reproductive health and well being and thus their world will be safe to live in and they will be safe wholly. The plight of girls and youth women at the coast of Kenya,the vices that they wake up to each day catalyzed by the dehumanizing outlawed traditions are saddening and alarming at the same time. It is very true as Lily has well narrated in her story,more support is needed,to help our girls and young women,to make the world a better place for them,to make them have hopes for tomorrow. It is upon the enlightened and empowered to help them stop the forms of poverty that belittles them each passing day,the days that for them are always dark and grows darker and darker and darker..